Considered as one of the greatest watchmakers of the past century and the grandfather of independent horology, George Daniels' body of work consisted on a constant desire to improve upon the traditional lever escapement. His co-axial escapement, invented in 1975, was considered to be the greatest horological innovation of the past 250 years. This escapement is a modification of the lever escapement with some features of the detent escapement. It functions with a system of three pallets that separate the locking function from the impulse, avoiding the sliding friction of the lever escapement. This makes lubrication of the pallets theoretically unnecessary and thereby minimizes one of the shortcomings of the traditional lever escapement. In celebration of the 35th anniversary of this groundbreaking invention, George Daniels set out to produce 35 hand-made watches. Inspired by his famous tourbillon chronograph pocket watch created in 1994, Daniels and Roger Smith set out to create a new British caliber that was to be produced by Roger W. Smith and finished to Daniels’ exacting standards and style. The 40mm gold case sits perfectly on the wrist whereas the hand guilloché dial is a gem of design and craftsmanship. The movement tactfully balances traditional British looks and the groundbreaking co-axial escapement. 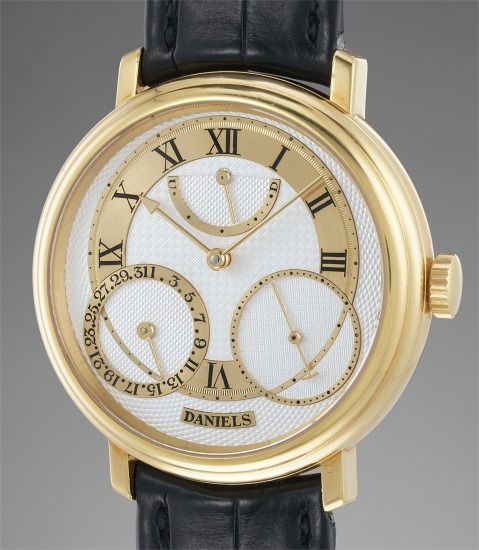 Only 35 of these pieces were ever made, and the present Daniels Anniversary Watch would be a wonderful addition to any collection of distinction. And, indeed, an opportunity that the most demanding and educated collectors should not miss.